After months of speculation that followed a successful Kickstarter campaign, the revived version of “Mystery Science Theater 3000” has arrived. And based on the first 7 of the 14 episodes that are now available, the show’s reasonably wide and passionately deep fanbase can rest easy because this iteration is pretty much a delight. Even though the basic premise has not changed in any significant ways, it has been given a few cosmetic tweaks. However, the unique comedic sensibility that drove the show—simultaneously whip-smart and genially affable—that kept those older episodes feeling fresh and amusing long after the presumed shelf date of jokes revolving around the Crash Test Dummies had been surpassed is still there. While this version may not win over those who never cared for the show in the first place, it will more than satisfy the veteran fan base and should prove winning to newcomers as well. Obviously the idea of cracking wise while watching a film was hardly a new invention—even “Workers Leaving the Lumiere Factory” probably had somebody razzing it back in the day—but it was the way that “MST3K” approached the joking that made it so special. For the most part, the show avoided taking cheap shots at the bad acting and shoddy special effects that were a hallmark of many of the films they were watching. Instead, they used the films as springboards for a dizzying array of jokes and comments that referenced everything from popular culture to the hard sciences to sports to history and politics with equal wit and aplomb. When I say “dizzying,” I am putting that mildly because once the show had firmly established itself, it would deploy anywhere from 600-800 jokes in each 90-minute episode, a fearsome amount to be sure but one that had two unexpected benefits. The sheer number meant that even when a riff fell flat, there was another one immediately on deck (there were so many that fans could watch episodes multiple times and still find new laughs) and it gave the writers the freedom to slip in increasingly obscure references and in-jokes on the basis that while maybe not everyone would get them, the right people would. Although Hodgson has spearheaded the revival and directed a number of the episodes, he has passed the baton on to a new generation of performers and writers who are clearly fans of the original but who have their own comedic sensibility to impart on the material. 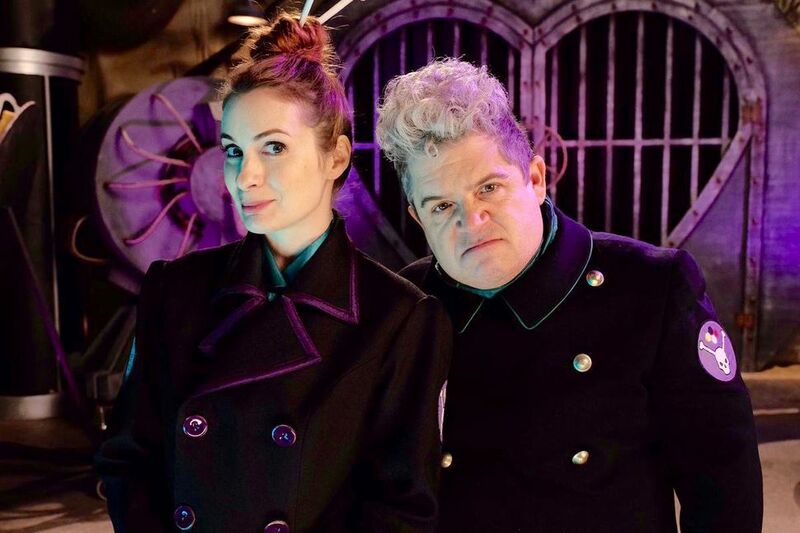 Leading the way in front of the camera is comedian Jonah Ray as hapless prisoner Jonah Heston, Hampton Yount and Baron Vaughn as the voices of Crow and Servo and familiar faces Felicia Day and Patton Oswalt as the new mads, Kinga Forrester and Max, a.k.a. TV’s Son of TV’s Frank. Behind the scenes, the writing credits include contributions from a rotating mix of talents ranging from writers from the original series to the likes of “Community” creator Dan Harmon and Joel McHale. Other changes range from slightly more elaborate special effects (with Servo being able to hover every now and then) to an expanded role for Gypsy, the lone female robot on the Satellite of Love, who has been given a normal-sounding voice and who turns up with the occasional joke as well, to cameo appearances from a variety of people ranging from former stars of the show to a number of famous people who shall go unidentified here. Despite these tweaks to the formula, what makes the new version of “MST3K” so entertaining is that it adheres to the same principles that made the show a success the first time around without simply coming across as a carbon copy. Although the show’s humor was oftentimes absurdist, it was never especially mean-spirited or cynical, perhaps the happy result of it being produced throughout its run from a studio in Minnesota rather than in the industry-centric climates of New York or Los Angeles. This version is produced in L.A. but the genial Midwestern sensibility has remained—the jokes may sometimes be obscure but they are never cruel and only a complete churl could take offense at any of them. The breadth of the references is as vast and unexpected as ever—there have been jokes referring to Bollywood star Abhishek Bachchan, the cult favorite “Heavy Metal Parking Lot,” Prince, the remake of “The Wicker Man” and the show’s own storied history of jokes—and while not every one hits, the percentage of those that do is astonishingly high. The between-film skits are also pretty inspired as well with a “Hamilton”-inspired rap involving the countries of the world and the giant monsters threatening their individual destruction being sung during a pause in the action of the Danish “Godzilla” knockoff “Reptilicus” coming off as an instant classic. As our hero, Ray does a very good job of echoing memories of his two predecessors while still finding his own unique approach while Day and Oswalt can barely control their geeky glee at getting a chance to play the mads. As Crow and Servo, Yount and Vaughn take a little getting used to in regards to their voices but once that happens, they both do good jobs of taking their familiar personalities of the characters—Crow’s quick-tempered impetuousness and Servo’s William Buckley-like demeanor—and giving them new spins. Fans of the original series will no doubt embrace the new version of “Mystery Science Theater 3000” and consider whatever they may have donated to the Kickstarter campaign to be money well spent. As for those who have never experienced it before, they may be so used to a pop culture-saturated universe in which everything seems to be a reference or allusion to something else that they may not realize just how innovative and influential this show truly was. But hopefully they will nevertheless find themselves responding to the incredibly high quality of the jokes and the good nature driving the entire project (this is one of the few revivals of familiar television properties that seems to be driven more by genuine enthusiasm than as a way of making a quick and easy buck) in large enough numbers to warrant the production of additional episodes down the line. That would be a blessing, as this revival is so much pure and unadulterated fun that for a few 90-minute chunks of time, one can forget all of their worries and simply just relax.